As a family we do alot of travelling. We do alot of ministry work on the streets of America and frequent the Kentucky Derby and Indy 500. Travelling used to be simple before our children were born. I used to have to just worry about hubby and I. Now, I have to think of things for my children to do while we are in the car for extended periods of time. I usually have bags of toys and books for them to keep them occupied. When travelling with children you mentally have to prepare for a messy car when you arrive at your destination. I don't know about you but my car is TRASHED when we get to where we are going! I have received a really neat product that I am going to share with you all today and it will definitely help on those tedious and long car trips!!! Her first grant just under her belt, Alyson Starr Probst, hopes to find time to bring her next idea to market. Juggling being a full time mom and starting up a company keeps this mother of two, Daniel (six & a half) and Matthew (four), quite busy. Had it not been for a suggestion from Natalie Tysdale, of WB2News, two days before the contest deadline, she wouldn’t have entered. The original inspiration for the Snack & Play Travel Tray came from Daniel, then two and a half. She couldn’t find a safe, practical surface for him to use when he was in his car seat or stroller. She invented it before incorporating her company in June 2002. With the help of the SBDC (Small Business Development Corporation); her package designer, Mary Snyder; and Colorado Contract Cut & Sew—her Starr was born. 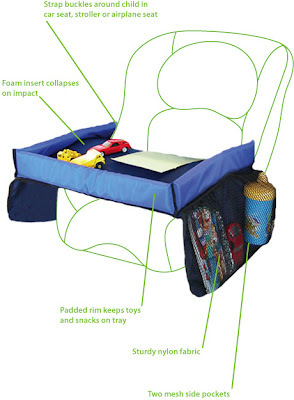 She doesn’t do things half way, and that is why her first product, the Snack & Play Travel Tray has received high marks for child safety in actual tests. It took her about 15 months to bring the idea from a thought and design to an actual prototype. In another 12 months, after refinements the product was launched. With five investors, the LLC is 95% women owned. For this review, I was sent the Snack & Play Travel Tray and was very excited to try it out! We have a spare carseat sitting in our living room waiting for my son to be big enough for it. I just have not had time to lug it to the basement. :) This spare carseat served for a perfect opportunity to try out this Travel Tray. I had my 2 1/2 year old sit in the car seat and I buckled her in just like I would in the car. Then, I attached the tray. It is easy to install as it has a long strap that goes around the back of the car seat and snaps on the side. I LOVE how this tray has edges on it so toys and crayons don't slide off onto the floor! She was able to color (and stay occupied while I baked cookies!!!) without crayons going everywhere. There are also nice netted side pockets for juice cups, books, and other storage. These pockets aren't too deep so she was still able to get things in and out of them...which is really great. One thing I realized after using this tray (and communicating with Alyson), I was hooking it on wrong. It buckles AROUND the child's waist. That makes alot of sense. So, in my opinion...I love the Star Kids Snack & Play Travel Tray! I am so excited to be able to use it on our next road trip. The edges on the tray will keep Hannah's toys from ending up at the other end of the car and the mesh pockets are great for extra storage! I am also happy about the wipable surface as that will be easy to clean. Mandatory Entry:Visit Star Kids and tell me which of their products you like the best. You do not have to be a blogger to enter, but you must have a valid email where you can be reached should you win. If you do not leave an email address, it must be where I can easily find it. This giveaway is open to US residents and will end 4/1 at 11:59 pm EST. One entrant per household. The winner will be chosen using random.org and will be notified by email. The winner will have 48 hours to respond, or another winner will be selected. 5. Follow Star Kids on Twitter. 1 entry. 6. "Like" Star Kids on Facebook. 1 entry. Disclaimer: I received no monetary compensation for this post. I did receive a Snack & Play Travel Tray for review purposes. All quotes are from the Star Kids website and email. All thoughts and opinions are mine. wow! the air play seems to be a nifty product too but my favorite is the snack and play. what a great idea! My favorite is the Snack and Play. I always need something for them to ut their coloring books on on the car. I own the cover tray which I truly love and was super helpful on our flight to Europe over Xmas !! My next investment will be the snack and play for our summer long drives to the shore and to DC to visit friends and family!! I like and follow Star kids on FB! The air play looks great! I think the snack and play is great! We drive alot so it would come in really handy! brilliant idea! the snack & play is my favorite since we are in the car much more often than we travel by plane. Love the Air play tray table. I like the Star Kids Snack & Play Travel Tray. I like the tray table cover for an airplane! I am your newest gfc follower! I like the snack and play tray best! Love the Snack & Play Travel Tray! I follow Star Kids on Twitter. I think Snack & Play is my favorite...it would be a lifesaver on our 18 hour trip this summer!!! The Snack & Play Travel Tray is definitely my favorite. I like the Snack and Play Tray the best. It would be great on a trip! My favorite Star Kids product is the Snack and Play Travel Tray. I am a fan of Star Kids via Facebook as Jill Myrick. I am following Star Kids via Twitter as jlsc123. The AirPlay Tray Table Cover looks very handy. This is wonderful. I could use this for my two grandsons when they sleep over on the weekend. The airplane travel tray cover looks like a great idea!! The air play is cool but I really like this one for the car better! I love the Air play too but would use the Snack and Play all the time! I love the snack and play best! What a great idea! I like star kids on fb! I really love snack and play! It seems like it would be really great to have!! The Snack and Play looks very nice. I follow Star Kids on Twitter under the username likwan. I follow Star Kids on Facebook under the username likwan.